The DTC4250E has a display that shows the printer error messages. When an error occurs in the printer, the PC shows the error message on screen with solutions. The display blinks in the location requiring attention. Locations can include the printer, input hopper, magnetic encoder, flipper, card path, ribbon, and data/communication device error. Each table uses a 3-column presentation to display a specific or printer error message, its cause and its solution. This format allows the troubleshooter to identify the error and its cause, and then perform the procedure provided in the solution column. This standard mode of identifying the problem and its solution should provide an efficient method of troubleshooting this printer. If you encounter problems beyond the capabilities of this error message table, you should contact Technical Support. Check the following, then press the Pause button to continue. Verify the card thickness setting is set to the thickness of your cards. Verify the Cleaning roller is properly installed on the Ribbon Cartridge. Check for card slippage. If necessary, run the Printer cleaning routine. Verify that your cards are within the accepted card size range. Verify the cards are not sticking together. The printhead lift has malfunctioned. Reset the printer and try again. If this problem persists, call for technical assistance. The printhead temperature sensor is not functioning or is not connected properly. Or, the printhead is not cooling properly. An unspecified system error has been detected by the printer firmware. No ribbon is installed in the printer. Install a ribbon and retry. Magnetic encoding verification has failed. Try encoding with a different card. Verify cards have the magnetic stripe. Replace the magnetic encoding module. The printer is not configured with the encoder data type that you are trying to send. Ensure that no encoding data is being sent with the print job and reprint the card. Install a magnetic encoding module. EEPROM is restored with factory default values. If changes were made in the Advanced Settings tab in the printer driver, click the Default button to reset these numbers. Reset the printer and try again. If this problem persists, call for technical assistance. A card has become jammed in the printer�s flipper table. The flipper failed to position properly while aligning a card or flipping a card. Clear any cards in the flipper table using the buttons to move the card out. Resume printing. The flipper table should be level when the printer is powered up. If the flipper Table is at an angle, open the card output door and manually level it. Then cycle the printer power to reset. Reset the printer and retry. If problem persists call for technical assistance. Request to print on 2nd side of card, but no flipper is installed. If a Flipper Module is present, ensure that the Print Both Sides option in the printer driver is set correctly. Unspecified system error detected by the printer firmware. 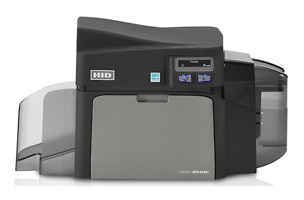 A card is jammed in the print station or card flipping area of the Printer. Clear the jam and press the Pause button. Multiple cards were fed into the printer. Verify the card thickness is set to the thickness of your cards, then press the Pause button. The printer is unable to feed a card from the input card hopper. Verify that your cards are within the perimeters accepted card size range. A card is jammed magnetic station. Clear any cards in the magnetic station using the buttons to move the card out. Press the Pause button to continue. The print ribbon has run out. Press the Pause button to continue or the ON/OFF button to cancel. The print ribbon installed in the printer does not match the ribbon type selected in the printer driver. Change either the installed print ribbon or the ribbon type selected in the printer driver. The ribbon is not able to find the next panel correctly. Check for jams/breaks. If broken, repair by taping the ribbon back on to the take- up core. The print ribbon has either broken or jammed. If jammed, clear the jam. If broken, repair by taping the ribbon back on to the take-up core. There is no ribbon or the ribbon tag information is corrupted or incorrect. Verify the printer driver settings for correct Ribbon. Try a new ribbon and continue. Press the ON/OFF button to cancel. This is a problem with the printhead Lift. Reset the printer and try again. If this problem persists, call for technical assistance. The print data sent to the printer is corrupt or has been interrupted. Select the ON/OFF button to cancel this print job and then resend the job. An error was detected during printing. The printer cannot locate the next ribbon panel in order to release the ribbon from the card. Ensure that the ribbon is not stuck to the card. core and manually advance to the next panel. An unrecoverable error has occurred during printing. The print ribbon sensor is out of calibration or has failed. Check for material blocking sensor and try again. Clear any cards in the flipper table, using the buttons to move the card out. Printing is disabled by SecureGuard until a password is received. Reset the printer and retry. If the problem persists, call for technical assistance. Ribbon needs to be removed. If problem persists, call for technical assistance. EEPROM restored with factory default values. If changes were made in the Advanced Setting tab in the printer driver, click the Default button to reset these numbers.